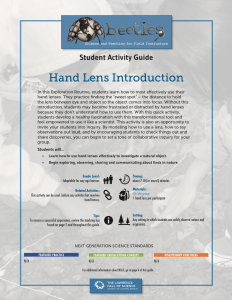 In this Exploration Routine, students learn how to most effectively use their hand lenses. They practice finding the “sweet spot” – the distance to hold the lens between eye and object so the object comes into focus. Without this introduction, students may become frustrated or distracted by hand lenses because they don’t understand how to use them. With this quick activity, students develop a healthy fascination with this transformational tool and feel empowered to use it like a scientist. This activity is also an opportunity to invite your students into inquiry. By modeling how to use a lens, how to say observations out loud, and by encouraging students to check things out and share discoveries, you can begin to set a tone of collaborative inquiry for your group. Learn how to use hand lenses effectively to investigate a natural object. Begin exploring, observing, sharing and communicating about finds in nature.